Last year, I added two raised garden beds to my back yard, loaded them up with compost and other organic enrichments, and planted a dazzling assortment from the local garden store. I would have zucchini galore, and carrots, and peas, and I could pickle my own beets, and come fall, I’d teach myself to can so that I could feast on my homegrown bounty all winter. Last year’s garden yield: some peas, a few tomatoes, and a couple of zucchini. This year, having eliminated the slugs (in one mighty onslaught that The Child filmed and uploaded youtube with the title “Slugpocalypse!”), the garden seemed to do well at first, but then it did the same thing it did last year – just kind of stopped growing, and sat there, looking sad. The Child didn’t see anything different, and told me I was obsessed again. I continued spraying with my internet-recommended mixture of household items that supposedly kill pests, but still nothing grew. Then, I noticed my pepper plant leaves, which weren’t leaf-shaped at all. Something was sucking the life right out of them, and try as I might, it was nothing I could see anywhere on the plant. I googled again, and determined that the problem might be thrips, but then again, might not be, and either way, my internet-recommended household remedy was clearly no match for this invisible assailant. Moreover, given the steady stream of critters that have invaded my home and yard this summer, I clearly need to go on the offensive against every possible critter, not just whatever it is that’s currently bothering my pepper plants. I go to Amazon, and find some concentrate that promises to eliminate all sucking pests along with a few other things, mix it up in a big sprayer my father bought to help me clean my fence, and spray it all over my garden. I do the same thing the next week. Three weeks later, my tomato plants are loaded with green tomatoes, my pepper plants boast little white buds, and my first cauliflower head has made an appearance. I may even get a zucchini or two this year. Of course, I still have to wait a bit for the garden bounty to reach my kitchen, but I’m pleased that eventually there will be ratatouille and zucchini bread and a slim chance that I may yet need to learn to can so that I am able to manage all the tomato sauce I’m going to have to make. In the meantime, we’re winging it – trying to cook summery dishes without heating up the house, or using a grill, which has reverted to a nonfunctional state in spite of repeated efforts to fix it. I ran across this recipe while searching for ways to use up the rye flour I bought to make Salted Chocolate Rye cookies a while back, since I enjoyed the rich flavor the rye flour imparted to the final product. I had sort of expected an odd-tasting cookie, mostly because I sort of expected the cookies to taste of caraway, like traditional rye bread does – but of course they didn’t, and neither do these crepes. These crepes, dear reader, are buttery. I struggled a bit with the recipe, because the batter did not “swirl and coat the pan” the way I expected it to, and my efforts to help it along tended to result in crepe deformities. I suspect the issue was too much rye flour: I failed to sift it – yes, I know better – and when I measured it out, tapped the measuring cup several times, and added more flour as it settled. The end result, though, was some delicious, rich, buttery crepes, that were a bit thicker and a bit smaller in diameter than crepes usually are. The Child adored them, and sliced up some strawberries to eat with hers. I opted to squeeze a bit of lemon juice over mine, as the recipe suggests, and loved the way the acid complemented all that butter. I love the deep flavor that the rye adds, which holds its own against all that butter, but doesn’t overwhelm it either. I’ve included the step for a caramelized sugar coating on the crepes, which I didn’t really feel added anything to the recipe – the crepes end up picking up even more butter (I love butter, but even I have my limits) for not that much sweetness and very little crispness, though that may have been my fault with the batter. Either way, next time I make these, I will try just a dusting of powdered sugar, or maybe a bit of sugar in whatever filling goes in. They didn’t really meet the criteria of not heating up the house, but they were worth it. 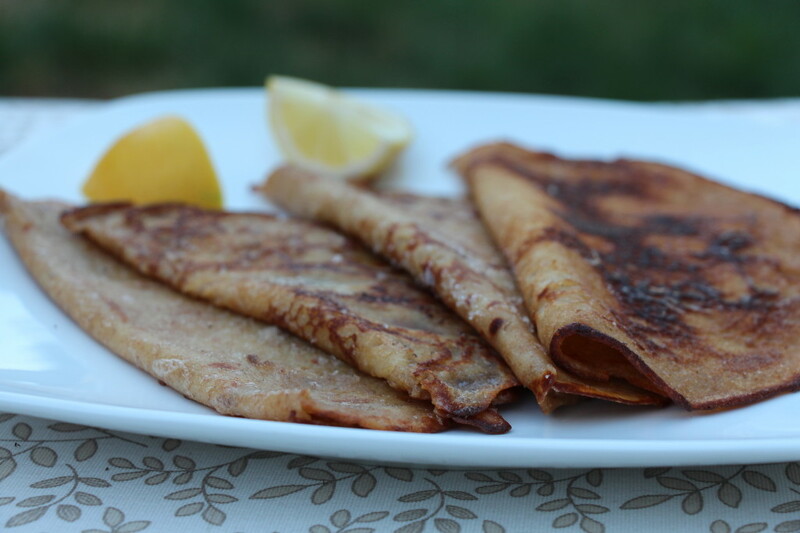 I do like a rye flour crepe! Better than buckwheat, more satisfying than those gluten free things that are available. My garden has been having the same type of onslaught. Things are just now getting the kinks out from earlier this season. I usually let the brown snakes and scaly lizards deal with the slugs when they appear, but any that make it to the house siding – get a spritz of Windex…. amazing stuff, just makes them immediately melt. I don’t know what we have here that would eat a slug. I’ve just been using little garden safe pellets and they seem to be doing the job. I don’t know how it is I just discovered rye flour! SO delicious, such a nice flavor in baked goods. I do have a recipe for buckwheat madeleines I want to try though, when it’s cool enough to bake again.